We are much happier floating in a bay, circling around our anchor rather than being tied to a dock in a marina. Don’t get me wrong, there are definitely times when marinas are a good thing; when a hurricane is bearing down, when the boat needs a bath, when it’s time to provision, or when the engine is giving you fits and needs some attention. We were in Barra de Navidad for almost a week, and it’s a lovely marina with pools and waterfalls and beaches and a swim up bar, and water taxis to take you wherever you want to go. But it’s a marina and we are very happy to be floating at anchor this morning watching the whales in the bay while enjoying our coffee. Our days in Barra were well spent though. The culprit of the recent engine overheating seems to have been vanquished! What was causing the problem? Darned if we know. I guess we should have only worked on one problem at a time, then tested to see if the temperature was okay under load so that we could determine what the actual issue was. We didn’t though, so one of the many things Marty did seems to have made Happy Dance happier. It may have been the highly technical jiggle this jiggle that, or it may have been the long curious gazes at the engine trying to read its mind. Maybe it was the impeller replacement, even though the old one looked like new. Possibly changing all the fluids in the engine, or taking the intake hose off and replacing the through hull attachment. Checking the heat exchanger, testing the temperature gauge, or cleaning the turbo may all have helped? At any rate, Happy Dance danced much easier yesterday on our way out to find the wind. We ran up the engine and the temperature held steady. Happy Dance jitterbug! After testing the engine and heaving a satisfied sigh, we shut ‘er down, rolled out the sails and headed to sea. The wind was of course blowing from where we wanted to go, so we decided that with a smooth sea and a steady 10-12 knot breeze that we should just head straight out until the angle was right for a single tack back toward the inner anchorage in Bahia Tenacatita. Perfect decision. It was one of those perfect sailing days that we yearn for, with a long low swell lifting and lowering us, wind waves on the surface singing a song as the ripples passed us by, a strong enough breeze to keep the sails full and send us dancing along at nearly 7 knots. Happy Dance loves to move and you can actually feel her jump up and take off when the wind fills the sails. It’s an awesome feeling. The ocean seemed to enjoy having us share the day too, sending dolphins, turtles to visit, and keeping us on a perfect heel for a few hours. When we were out about 6 miles out we tacked back and held the line to Bahia Tenacatita, while also missing the off lying rocks. As we came back toward shore we started hearing the sound of the swells crashing into the rocks and watching the plumes of white spray shooting into the air. There are a few submerged rocks off shore too, and to see the water suddenly erupt in a frothy white when the trough of a swell passes over is always very impressive. We followed our line right into the anchorage, between Roca Centro and Punta Chubasco. After passing the rocks we pulled in the sails, started up the engine and drove close to shore to drop the hook in 20’ of water, and of course take a swim. It’s nice to have clear water again and to be anchored off a long stretch of sandy beach. There’s a hotel off in the distance, but for the most part there’s nothing on the beach so I’m looking forward to some long walks on the sand. The rocks on the point look interesting too, so I’m sure a paddle over there is in my immediate future. Last night the man in the moon winked at us from his tilted angle and somewhat less than full face, the stars were out and the sea was calm. The beach was dark and the only lights were from the mast lights of our neighbors twinkling like bright stars. I love being at anchor! Hi Sue and Marty. I’m the guy you met on the beach in Cuastecomates yesterday. It was lovely to watch you glide in and set your hook. . . and to meet you both. I will henceforth follow your adventures online and wish you bon voyage! Let me know if you need anything from the States. Thanks Brent! It was nice of you to stop by and chat! Also appreciated the wifi password and the beach toys. I’m hoping I don’t hurt my arm trying to throw the football! 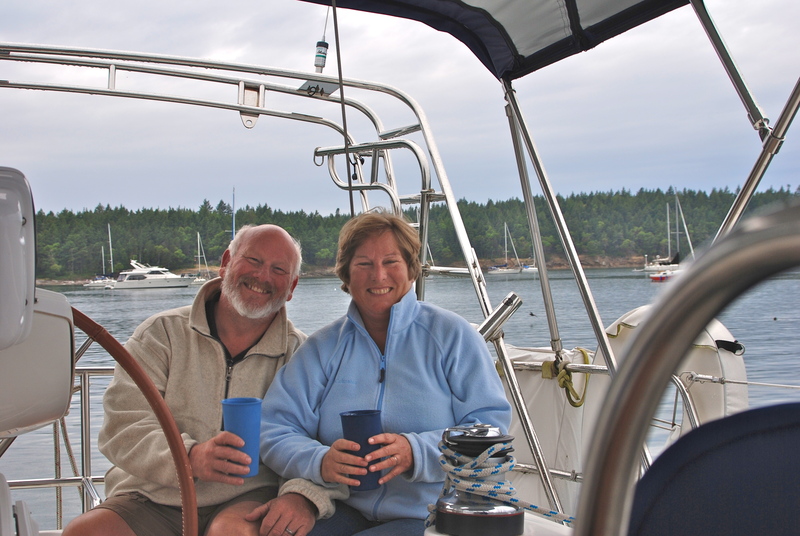 Good luck with your retirement and enjoy the sailing of the Pacific Northwest. I can’t begin to count your amazing adventures since we bid you adieu in San Diego. Your lives read like a wonderful never ending fairytale. Sail on. . . . . and keep in touch.